The Big Ten Championship Game features the only unbeaten team in the Power 5 conferences. Despite the fact that there is a good chance that a two-loss team will make the playoff, Wisconsin likely has no margin for error when it comes to making the top four - they need to win to be in. If Ohio State wins then they will be in the playoff picture, but they will be far from a lock. They will need Oklahoma to lose in all likelihood, and they will have to hope that they earn enough style points to get past Alabama. The more dominant they win this game the better for their case, too. All that intrigue leads to a pretty compelling championship game. I can't remember a time when a major conference team with a tradition for success has gone undefeated and had so little respect as a result. They are the only unbeaten team in the Power 5, and there are those that would argue that they shouldn't be a playoff team even if they win here. That's a ridiculous argument, but the reasons behind it are worth a look. First, they don't play a particularly exciting style of play and don't have a QB that jumps off the screen and right into your heart. More significantly, though, is the schedule. The Big Ten's divisions are comically unbalanced, so Wisconsin managed to avoid Ohio State, Penn State and Michigan State this year. They played just two teams that were ranked when they met them - an Iowa team that wound up 7-5 and 8-4 Michigan. Beyond that the only thing close to a quality win was against Northwestern. They didn't help themselves, either, that the nonconference schedule was a farce. The biggest things that the Badgers have going for them, though, is that beating Ohio State would be a legitimate result, and that Alabama, the biggest threat to their playoff position, has a schedule every bit as underwhelming - and without a conference title. One thing that is crucial to remember about Wisconsin is just how deceptive their stats are. They are the top defense in the country in terms of pass efficiency, but it means nothing. They just haven't faced anyone who can pass. Michigan's Brandon Peters, despite being raw, was the best passer they faced, and he was having a lot of success picking on the secondary until he was knocked out with a concussion. This defense has faced no one, and hasn't been tested through the air. I'm far from the biggest J.T. Barrett fan out there, but he can throw the ball, and he is going to really test this secondary. If Michigan was able to do some damage then so can Ohio State, and that is going to be a problem. Wisconsin has the top overall defense by yards allowed, but that isn't going to be reflected in the results here. Wisconsin has a Top 20 rushing offense, and Jonathan Taylor is having a special year. They need to be able to run the ball to have a chance at success. There's one big problem, though - this Ohio State defense held Saquon Barkley, the one Big Ten back better than Taylor, to just 44 yards on 21 carries - a dismal 2.1 yards per attempt. The Buckeyes have faced big backs and found ways to be okay. That wasn't a limited situation, either. Michigan ran 36 times for just 100 yards. Michigan State ran 34 times for just 64 yards. There is a good chance that Ohio State can force the ball into the hands of quarterback Alex Hornibrook and his passing game. That is not something that any Wisconsin fan wants to see. The game opened with Ohio State favored by 5.5, and that has since climbed to 6.5. Nearly three-quarters of bets have been on Wisconsin, so the movement tells us that sharp money is heavily on Ohio State. The total opened at 53 and has fallen to 51.5 in early betting action. The Buckeyes are 5-1 ATS in their last six neutral-site games but just 1-4 ATS in their last five games overall and 2-7 ATS in their last nine games against teams with winning records. 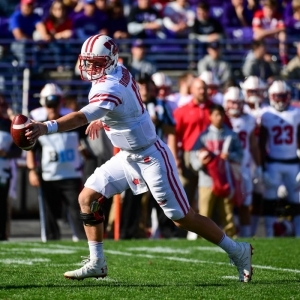 The Badgers have covered their last four spreads but are just 3-7 ATS in their last 10 neutral-site games. The underdog is a strong 12-3-1 ATS in the last 16 meetings between the teams. This one feels very straight forward. Wisconsin gets credit for not having a loss but not a lot of respect for who they beat. Ohio State hasn't been consistent, but they have been much more tested, and they match up very well against the Wisconsin team. At a touchdown or less given up, Ohio State is a no-brainer of a pick.